I had so much fun indulging. Eventually though, I reached the “What am I doing with my life?” point, and the button on my jeans hated me for struggling to stay buttoned. As much fun as I was having multiple cheat meals, I started to feel gross and started craving a salad instead of sweets. So I had a Caesar salad. Granted, not the healthiest of salads, but it was green. So that was a start. 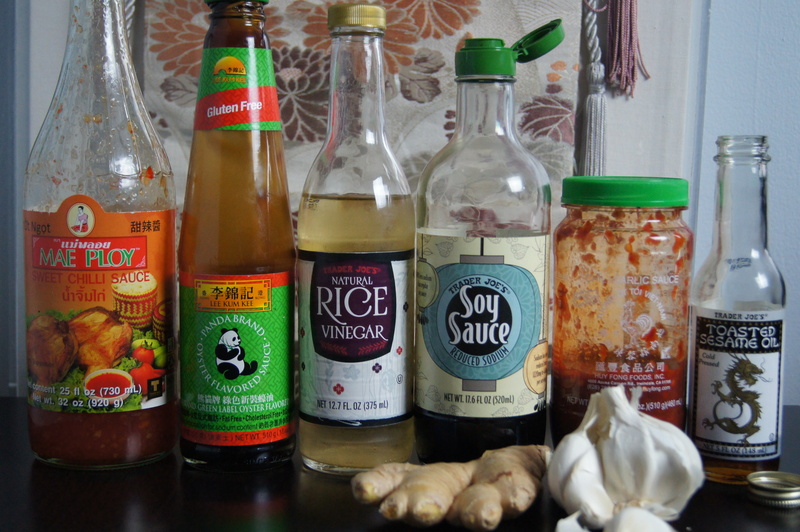 I wanted to create a stir-fry sauce to toss the vegetables and tofu in. I stood in my kitchen looking at all my Asian ingredients and couldn’t decide if I wanted something spicy or sweet. Standing there and trying to make a decision of what flavor I wanted reminded me of going to McDonald’s after school. There was a McDonald’s conveniently located steps away from my high school (shout out to Boston Latin Academy!) and I’d go there with my friends at the end of the day. I could never decide if I wanted a Big Mac or a 6-piece Chicken McNuggets. 90% of the time, I always chose both. I know that sounds gross to some, but when you’re a teenager and this is one of the toughest decisions of your day, it’s not so gross after all. But what is gross – and also downright criminal – is that I no longer have the metabolism of my 16 year old self and can’t make – rather, shouldn’t make – these types of decisions. So, like my McDonald’s decision of choosing between one or the other, I decided to just go for it and choose both. 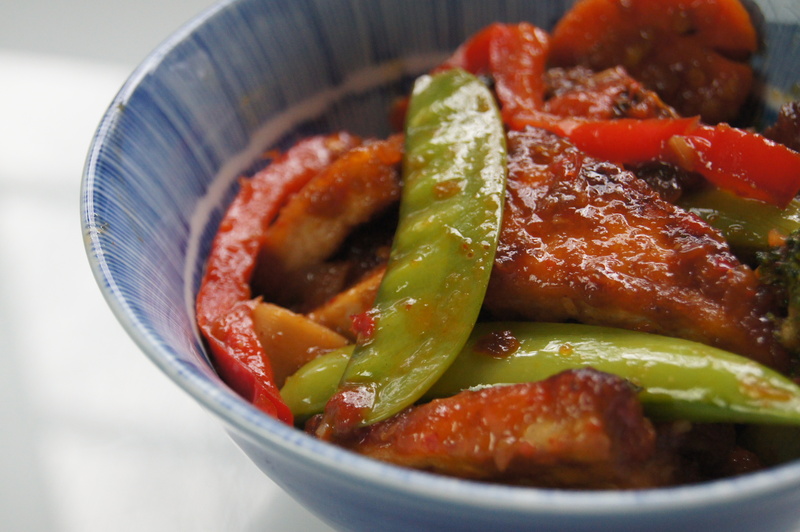 I was going to create a stir fry sauce that was both sweet AND spicy. And just like my McDonald’s decision back in the day, it was a wise decision. The sauce was a perfect balance of both tastes and it was so savory. Though if you only want a mildly spicy stir-fry sauce I would recommend reducing the amount of chili garlic sauce. Though I used tofu here, you can definitely use chicken, beef, and even seafood – like shrimp, scallops, or a mild white fish. I will definitely make this again with either one of those seafood choices. Or maybe I’ll use all three considering my decision making skills with what food to choose. 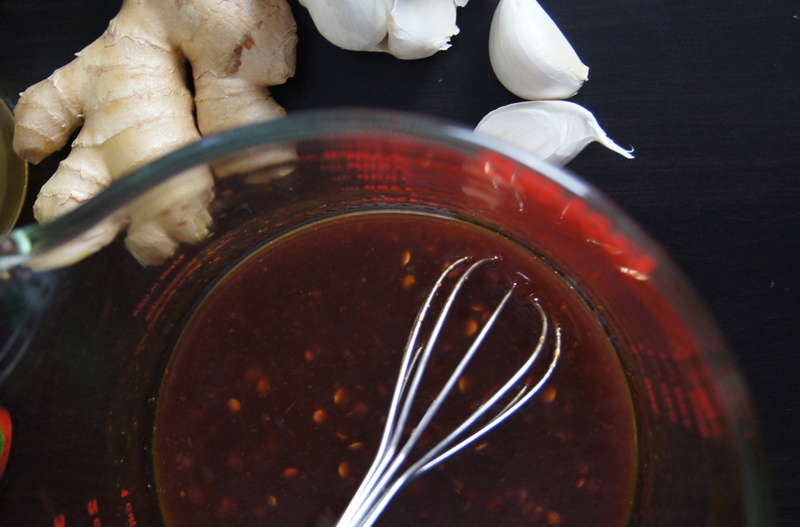 Another great and versatile thing about this sauce is that you don’t have to limit it to just a stir-fry sauce. It makes a great dipping sauce too. I discovered this after I pan fried the tofu. It was delicious and would be great with something like Lola’s Chicken Fingers or fried shrimp. I had a lot of fun putting this recipe together and I hope you do too. I also hope that 2017 will be an amazing year for all of us with lots of love, great experiences, and tasty food! Drain tofu and wrap in several layers of paper towels. Put wrapped tofu on a plate and place a cast iron pan or 28 oz. can on top. Let rest for 10 minutes. In a bowl, combine all sauce ingredients and whisk to combine. 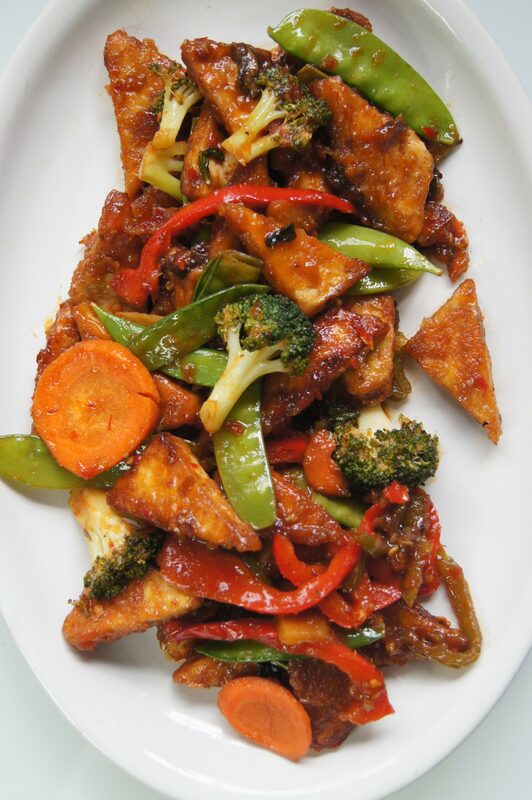 Once tofu is fully drained, cut horizontally in the middle and cut each half into triangles (or cut into ¾ inch cubes). 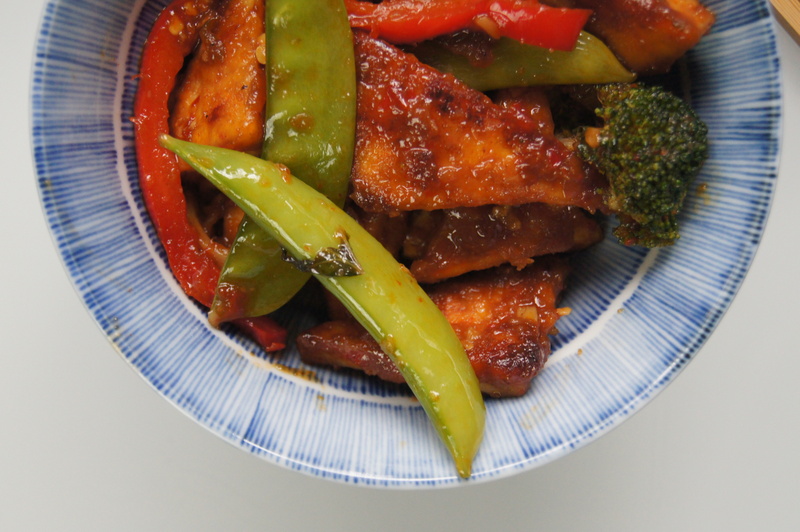 Place tofu in a medium sized bowl and add sesame oil, soy sauce, maple syrup, and corn starch. Toss gently to combine. 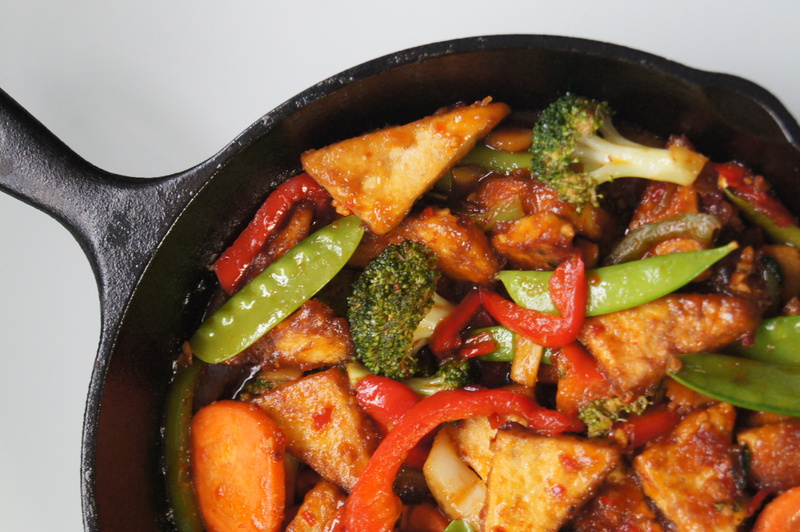 Heat a pan (preferably a cast iron pan) on medium high heat and add tofu. Brown on both sides and drain on a plate, lined with a paper towel. If needed, add more oil to the pan. Add ginger and garlic and stir until fragrant, about 30 seconds. 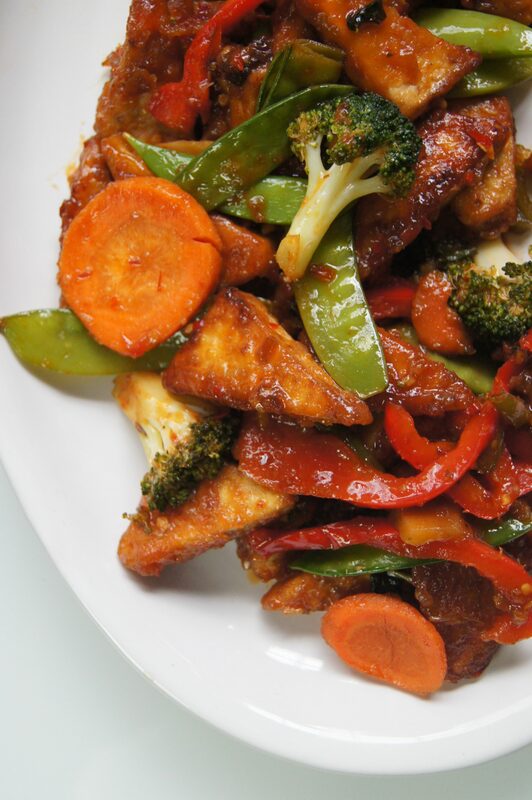 Add vegetables and stir fry until crisp-tender. Whisk sauce and add to the pan. 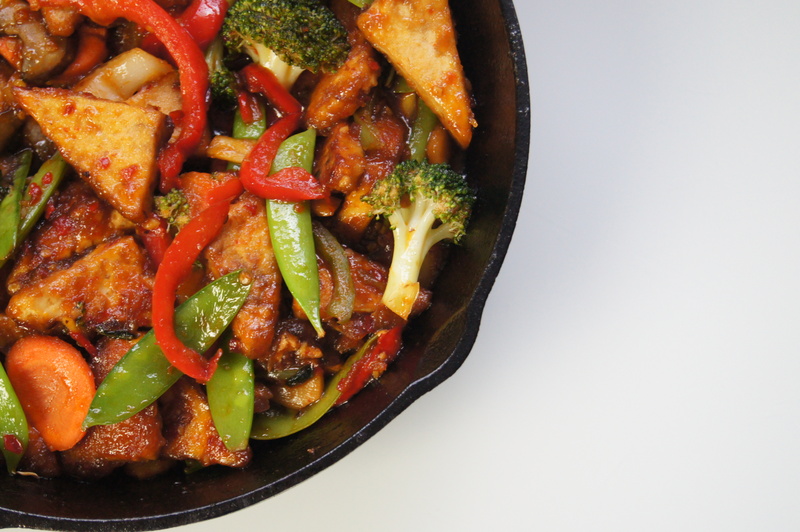 Stir fry all ingredients until sauce coats tofu and vegetables, and is warmed through, about 2 minutes. Serve with steamed white rice, brown rice, cauliflower rice, quinoa, or any other accompaniment of your choice.